It appears that nature outdoes us when it comes to festive displays. 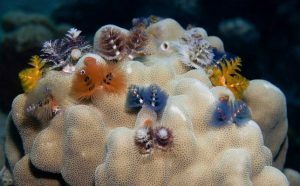 Coral reefs showcase their decorations all year round in a vibrant celebration of Christmas…or more particularly, the Christmas Tree Worm. These colourful creatures (Spirobranchus Giganteus to the scientifically minded!) are found in tropical waters all around the world. They catch their microscopic prey in spiky bristles, which are coated in sticky mucus for added mealtime security. But what you see isn’t all you get with these segmented worms – only the crown is visible – 2/3 of their body lies hidden within the coral. And while it’s obvious camouflage is not one of their skills, they have the ability to retreat very quickly into their hole if danger lurks close by. At Ocean Life Education we love everything “Weird and Wonderful” – especially when it comes to marine creatures. The crazier looking, the more colourful the display – we’re hooked. In fact we enjoy it so much we dedicated an entire program to all things that little bit different underwater. Want to know how a mudskipper breathes out of water? Why a stone fish has a face only a mother could love? How a nudibranch gets its technicolour coat? Why a northern stargazer always looks up? We have the answers and we love sharing our passion for all things quirky in the sea. And we’re constantly learning as well. Only 1/3 of the estimated one million creatures living in our oceans have been identified – so just like our colourful Christmas Tree Worm – much remains hidden, waiting to be discovered. This entry was posted in Uncategorized on December 19, 2017 by oceanlifeeducation.